Our hotel has 21 unique rooms in two buildings. Our Hotel’s main building has 12 unique rooms, all with a theme of their own filled with antiques and delightful details. 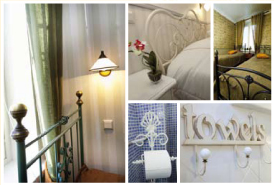 Separate house Vouti House of steward offers 9 rooms which are decorated in traditional country style. Each room is air conditioned and each room has its own bathroom. All rooms are equiped with TV, hairdryer. We also have WiFi. Furniture in the rooms are either unique antique pieces or period furniture. Rooms in the main building are suitable for allergetics. Nearly all rooms can also be equipped with a baby crib. Room rates start from 96 €/single room and 109 €/double/twin room. Rates include breakfast.